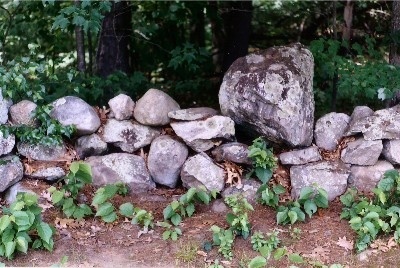 Robert Frost’s Mending Wall in Derry, NH. Stone walls are evocative features. This is as true for children today as it was for the literary giants of New England culture. A very good source book for New England culture. My entry titled “geology covers many themes that tie regional culture to this subject. Stone walls are in the background for the New England literature, especially works by the Transcedentalists. They convey a sense of material strength, cultural ruin, Yankee expedience, the depth of time, and of elemental simplicity. Robert Frost’s Mending Wall: Of all humanists to use New England’s stone walls as literary devices, the poet Robert Frost stands at the head of the pack. His most famous poem, Mending Wall, is often required reading as soon as students are able to understand symbolism, metaphor, and myth. Other poems by Frost with stone wall themes include Ghost House and Star in a Stone Boat. Have your students read and discuss any of these poems. Responsive Writing: Professor Thorson has suggested that “The soul of New England perches on a rock.” (Encyclopedia of New England, Yale Univ. Press, 2005, p. 567-569). He believes that many New Englanders have a subconscious yearning to see the earth’s crust each day. Stone walls give such folks their best opportunity to sense the presence of deep time. Bring your students to a convenient stone wall, have them dwell on such themes, ask them to write, and see what happens. 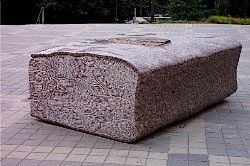 Statue of book on plaza of Dodd Center, University of Connecticut. For scale, statue is the size of a pickup truck.